A white dwarf star in galaxy M82 has exploded. Fed on a diet of hydrogen and helium from a neighbour that was a bit too close, it suffered a terminal case of cosmic indigestion. That little snack pushed it over the Chandrasekhar mass limit (1.4 solar masses) and induced a runaway nuclear reaction – the entire star is blown apart. (Type 1a SN). Because all type 1a supernovae are of similar mass and composition, when they explode,they are equally luminous and thus act as “standard candles” for astronomers to confirm distances. M82 lies close to Ursa Major and the Supernova is quite easily seen close to the galactic core. It should get considerably brighter over the next few days and may get to binocular brightness. I set up my Nexstar 8SE and aligned with a 36mm Baader Hyperion eyepiece. With M82 in view, I swopped to a 22mm Nagler T4. M82 was easily visible – there was 1 bright field star and just beside it was the supernova which looked like another bright star. I tried a 17.3mm Delos but thought the Nagler view was better. Glad to have a clear night to observe Orion with my Nexstar 8SE. Nice views of M42, M43 and M78 then onto the more difficult stuff. I found the combination of Sky Safari 3 Pro and Deep Sky Browser very helpful in checking I was in the right star field. tracking was good all night. I compared the TeleVue Delos 17.3mm with the Vixen VLW 22mm eyepieces. The Delos certainly is flat and sharp right to the edge of the image but somehow looked a bit “processed”. Stars looked a little more natural in the Vixen. The 72 degree field of view in the Delos was impressive and appeared wider than the 68 degree field of the Vixen. 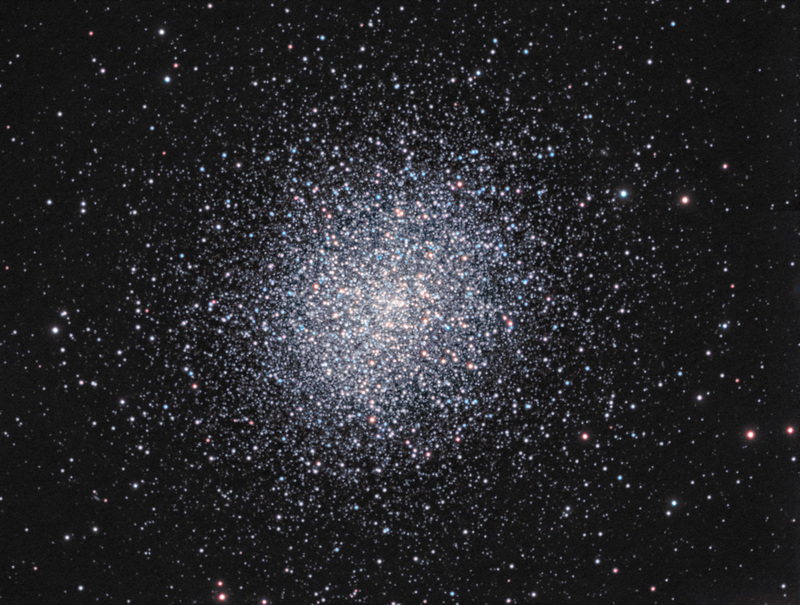 The great Hercules globular cluster (M13) is a superb object to view in the night sky. It is composed of about a million really old stars that form a spherical mass, held together by gravity. It is one of about 200 globular clusters that orbit our galaxy – the clusters are part of our galaxy but tend to reside in a halo around the central galactic bulge rather than in the main galactic disk. I’ve observed it though my Nexstar 8SE now on several occasions but with different eyepieces. It appears as a slushy snowball of stars that gets denser and brighter towards the centre. I recently observed it through a high quality, high contrast Vixen LVW 22mm eyepiece and was a bit surprised to see a number of dark channels running through it. “That can’t be right” I thought, “I’ve never seen that before and you don’t see it in pictures of the cluster”. It turns out I was looking at a feature known to visual observers as “the propeller” – the feature is made up of some relatively star poor regions which are best seen visually, long exposure or stacked imaging tends to fill in the gaps. Sometimes it’s difficult to navigate through all the hype about eyepieces but so far I’ve found the wide angle views through my Baader Hyperion 31mm modular aspheric and the high contrast views through the Vixen LVW 22mm to be outstanding. It got dark at 1230MN so stepped out for some observing. It still wasn’t dark enough to see galaxies well but open clusters and globulars were fine. After a while, I thought I would try out my new Baader Hyperion 31mm Modular Aspheric in 2′ mode – I thought it was amazing. Very flat, very wide views that made looking at the globular clusters in Ophiuchus a pleasure. I will try it as my default general purpose eyepiece for a while. 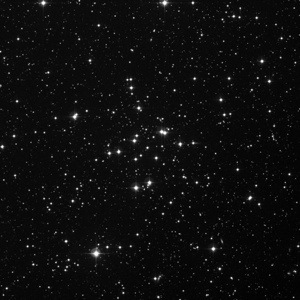 M34 open cluster. DSS image. Image is 30 arcmins across.